Said to be titled "Apex Legends", this new Titanfall game will be one that's based on battle royale! The game is reportedly free-to-play and will be available on PC, Xbox One, and Playstation 4. The game will apparently support up to a maximum of 60 players per server with three players max per team, and will feature character classes with unique abilities. Another tipster remarked that the game is a mixture of Titanfall, Overwatch, and Blackout from Call of Duty: Black Ops 4. 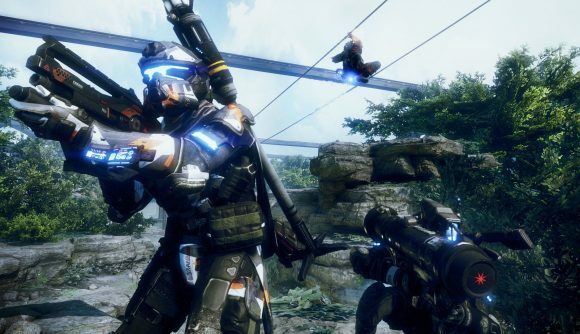 A free-to-play game set in the Titanfall universe is set to release on Monday, according to rumors. These microtransactions will be similar to those featured in Overwatch so hopefully this won't turn into a pay to win game. There is other evidence that bolsters this rumor. The descriptions says that they are "Computer game software; Video game software; Downloadable computer game software via a global computer network and wireless devices" and "Entertainment services, namely, providing an on-line computer game". It's also since been discovered that the website playapex.com leads back to EA's website, so that brings a little more credibility to the rumours. That being said, it wasn't a surprise as Apex Legends as it was leaked last week. It's quite possible that this is just a spin-off that Respawn plans to release while it continues working on Titanfall 3. So, if you like Respawn, our games or even me, you should tune in tomorrow. Supposedly, Apex Legends will actually be running on a heavily modified version of Valve's Source Engine. The first is Apex Legends, while the studio will be putting out Star Wars Jedi: Fallen Order soon as well. It nearly feels as if EA tries to sabotage their own games with overlapping release windows.